If your automatic floor shifter has play in it left to right then this is the culprit. 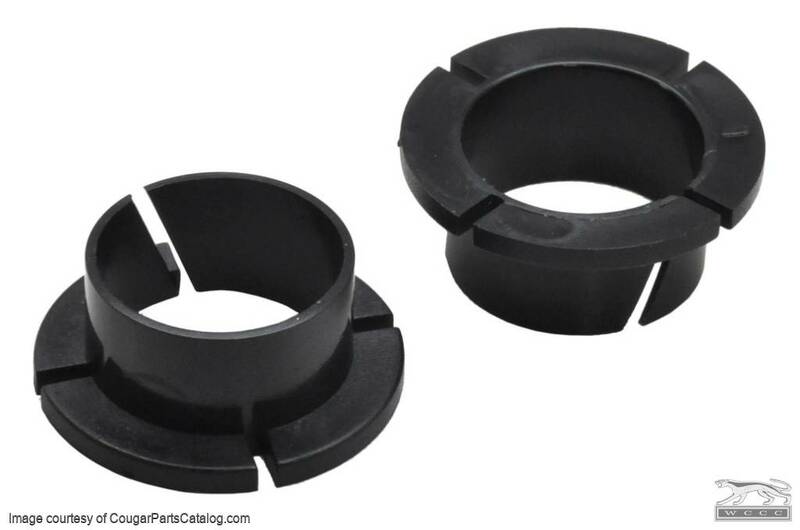 Easy to install, (more difficult if you have a 67-68 with center console) these are made from a wear resistant plastic that is better than original. Sold as a pair as two are required per car. This bushing was used in all Ford products equipped with a floor shift automatic from the 1965 Mustang to the late 70's Pinto. Unbelievable difference! If you have ANY slop in your shifter- THIS IS THE KEY! It is now so tight, I wonder if I did something wrong! haha. BUY IT!!! Changing the bushings went just fine. They made the gearshifter tight, With little, almost no sidemovments at all. The gearshifter must have been that way, when the car was brand New. So i can recomend those bushings, for fixing the gearshifter. I saw an youtube video of how it was done. Fit like a glove and really helped get rid of the slop. Easy to install.